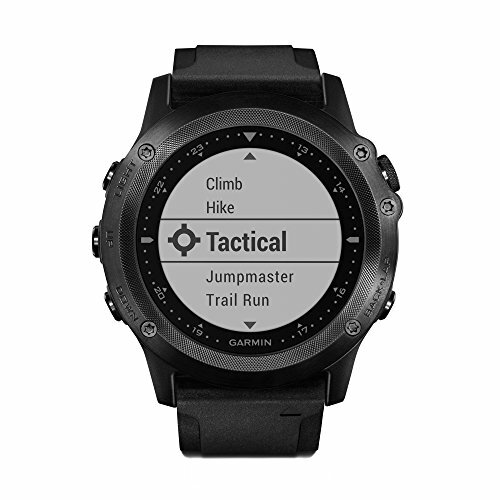 Garmin tactix Bravo Sapphire Multisport GPS Watch If you're an athlete who's into military training or outdoor sports of the more extreme kind, this durable, multifunctional tactical/fitness/everyday watch and activity trainer is designed with you in mind. Meet the tactix Bravo by Garmin, a rugged, special-ops inspired GPS watch, designed to deliver fitness training, outdoor navigation, and activity tracking in the most intense environments. Train day or night with the versatile display that's equipped for both bright sun and dark nights. Features: The rugged engineering, equipped with a stainless steel antenna coated in diamond-like carbon (DLC) plus a stainless steel bezel and scratch-resistant dome lens, is engineered to weather the harshest of environments and use, while still functioning as an everyday watch. Non-reflective, all-black design reduces your visibility in the field, shielding you from potential threats. The sunlight-readable display quickly adapts to activity occurring beyond sunset with its night vision goggle compatibility. Don't lose focus or strain your eyesight due to excessive squinting-the 1.2-inch high-resolution color Chroma display with sapphire lens is visible in bright sunlight Features GPS plus GLONASS for increased coverage accuracy with an automatic calibrating altimeter, 3-axis compass, and barometer. Navigate back to your starting point with Tracback, which stores up to 10,000 per track. Get real time performance data including distance, pace and calories, plus Auto Pause and Auto Lap to enhance your training, including indoor workouts. Switch out your black strap with the included olive-drab-colored nylon strap for more versatility. Into skydiving? tactix Bravo comes preloaded with Jumpmaster software, offering HAHA, HALO, and Static jump types. The long-lasting rechargeable battery gives you 20 hours in GPS mode, 50 in Ultratrac battery saver mode, up to 3 weeks in smartwatch mode and up to 6 weeks in watch mode.